As you may know already through our Facebook and MeetUp events, the Korean Cultural Centre UK (KCCUK) is hosting a special day dedicated to all things Korean culture with all relevant London-based organizations joining for presentations and coordinating their own events. 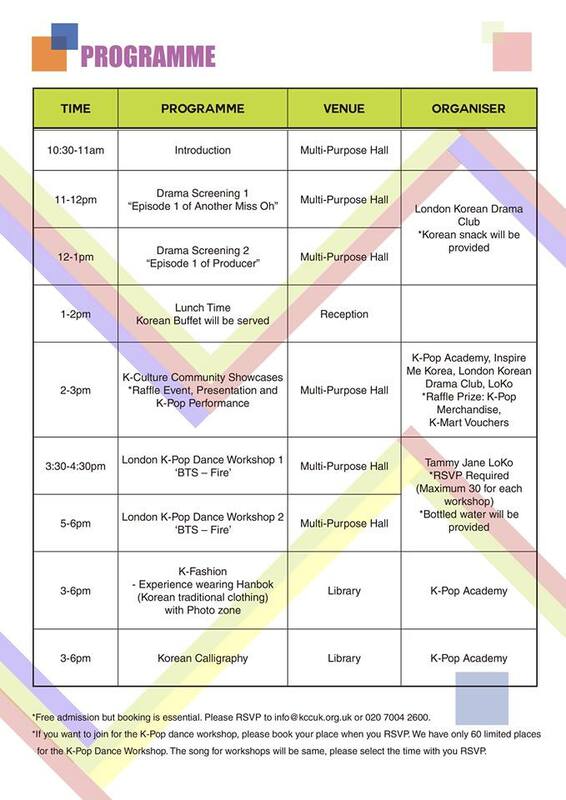 The London Korean Drama Club will be there side-by-side with LoKo Kpop Dance Workshop, Kpop Academy, Inspire Me Korea and YouTuber Margarita, who will introduce the presentations! 2 Kdrama screenings, with 1 episode of The Producers (KBS) and 1 exclusive episode of Another Miss Oh which will still be on air on tvN in South Korea – courtesy of CJ E&M! A lucky draw with a Kdrama boxset. You can review the full programme below. We hope to see you all of those who have RSVP’ed with the KCCUK. If you haven’t yet, send an email to [email protected] to be put on the waiting list, as we have been told we have reached the max 80 participants already!